If you ask anyone about their retro role-playing opinion, nine times out of ten, you will hear them rave and rant about some RPG published on the Super Nintendo. The sheer volume of iconic role-playing games that appeared on the Super Nintendo is heralded by plenty of gamers. 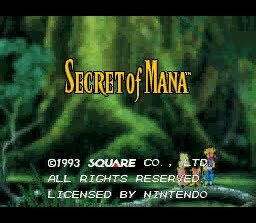 One of the most incredible of those games is Secret of Mana, a game by a little company called Squaresoft (ever heard of them?) in their immense heyday. It certainly was not lost in the hustle and bustle of Final Fantasy III and other such games of the time, as it has still carved out a place in RPG history. Recently, it was even re-released on the Wii’s Virtual Console. How’s that for longevity? 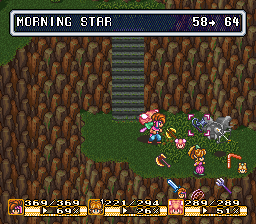 Secret of Mana starts off as many RPGs do. A young boy- Randi, though you never actually learn any main character’s name unless you research the fact- is living a quiet life in a quiet village with his friends. Peer pressured into venturing through dangerous terrain in the nearby forest, he finds himself at the bottom of a waterfall and face to face with a sword. It’s not just any sword, though. 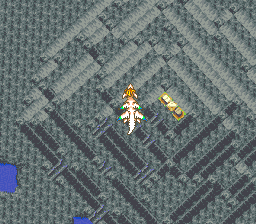 This is the legendary Sword of Mana and, lo and behold, he pulls it from its earthen sheath, finding that he is the one fated to save the world. Throughout his adventure to restore the Mana Sword to its former glory by visiting each of the elemental temples in the world, he runs into two others who join his adventure: a wise-cracking sprite named Popoie and a strong-willed girl name Purim. As the three travel from shrine to shrine, they realize that the Empire (the evil force is always called ‘The Empire’, right?) 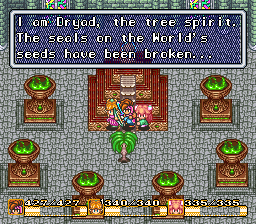 is trying to unseal the seeds at the shrines to reactivate the Mana Fortress, an ancient legend that they plan to use to bring ‘peace’ to the world. Of course, there are layer upon layers to the story as you go on, but needless to say, there are a lot of twists, even by today’s standards. The premise itself is cliche by now, but at the time, these conventions were not so overused. Each of the characters has their own story that progresses as the main story does, and none of them truly end until the last minutes of the game. As you journey with these characters and their friends that they meet through their adventure, it is easy to find yourself relating to them on some level or another. As far as RPG’s go, most games strive for this kind of connection. It is dulled a little by some of the trite dialogue and situations, but that is to be expected. The game itself was butchered on the way through the translation machine from Japan to here, as there were limits on speech in the translation and the game was shortened in production. The game does not suffer if one does not know this, however. While it is still a lengthy game- I may have logged about forty hours or so in my playthrough- the pacing never lags, and you’re always finding something new to do or someplace new to venture to. The most unique feature of this game is that it can support three players. Each player can control one of the three heroes and can drop out or join in at any time. This makes for a very unique gaming experience when you get the chance to play that way. With my play through, I only got to play with two of us, but it was still that much more enjoyable. While the multi-tap type games never caught on for the Super Nintendo, this game is famous for its ability to support three players at a time. Speaking about RPGs on the whole during the Super Nintendo era, they have a great blend of humor and sincerity that is missing from a lot of RPGs of today. There is something endearing about the characters and the situations that, while someone may be in danger, once they’re out of danger and you have breathing room, your characters may crack wise or be affected, depending on what the story calls for. 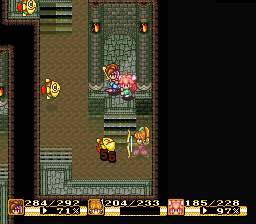 Secret of Mana is a great example of this charm, and it’s a great advantage that it has over other games of it’s ilk. Rarely does the emotion of the moment miss the mark, and even when certain characters would say or do things that would make me shake my head, there was still something charismatic about them. Popoie is probably the best example of this, considering his greedy and somewhat selfish temperament through much of the game, he is still a character that you care about as the game progresses. Thanks to the fact that the story centers on the entire cast rather than just Randi, you feel even more of a connection with the characters. The game’s story is probably the biggest draw. It has a lot of depth, especially for a game of its time, and it ties up loose ends beautifully as it goes. In fact, if I wanted to, I could probably write an entire review on how amazing the story is. Containing it into a short paragraph, however, the game does handle its conflicts and situations, even with minor characters, pretty gracefully. People who play through this game very rarely tend to forget characters like Krissie, the leader of the resistance, and Mara, a troubled woman with a tragic past, even after they’ve fulfilled their roles. You become terribly invested in the characters and their plights, regardless of whether they’re fleshed out or show up in a tertiary role. The game has an interesting way of keeping characters constantly upgrading, as well, as not only do your characters level up throughout, but so do their spells and weapons. The more you use a given Elemental’s spells, the higher their level gets and the stronger they are (and as a fun tidbit, maxing out an Elemental gives you new animations for many spells, as well). The weapon system is probably the most interesting of the leveling factors, however. As you progress through the game, you’ll find ‘orbs’ which you can use at a blacksmith to upgrade one of eight weapons, depending on what the orb is designated for. As you upgrade them and use them, your proficiency with the weapon grows, giving you better and stronger ‘charge’ attacks. As you continue, these attacks become integral to keeping your characters standing. Interestingly enough, the weapons are also used to help solve puzzles, such as using the whip to cross certain obstacles by launching your characters over them. There’s a lot of innovation in this little cartridge. If there is one glaring flaw, it would be the already mentioned ‘editing’ of the text and story. While the story is already amazing, some of the dialogue can come off as rushed or disjointed- a chronic flaw in many SNES RPGs- but it still works. The player might scratch their head a bit over some of the things characters spout or reactions that are presented for the situation at hand, but overall, the game’s presentation and content do make up for it. Also, while not a flaw, the game is very linear. You’re not going to find many side quests or reasons to go out of your way unless you are leveling up or just feel like backtracking for treasure or the like. This doesn’t hamper the game play at all, but many people who play RPGs today might find this to be a deterrent to some of the other games of the time that did offer those kinds of quests. This is less of a flaw and more of a footnote. Now, onto the part that Squaresoft shines the most at: the front end. This game is beautiful, and I may go so far as to say that it’s probably the best looking RPG on the system to hit this side of the ocean. Characters are well constructed, the terrain and textures never get old, and many of the boss enemies are absolutely incredible. The only- and I mean only- complaint I have about the visual aspect of the game is during one particular battle, the boss, beautiful through most of the fight, rushes toward the screen and becomes a bit of a pixelated mess. Those who have played know exactly what I’m talking about. That aside, though, the game is incredible to look at. The sound is also amazing and eclipsed by very few games of the time. The sound effects are all spot on and, for the most part, clean and fitting (the magic level up sound may surprise at first, as it does seem to come from out of nowhere). The music is great though and conveys a journey in and of itself. The track ‘The Oracle’ is this writer’s personal favorite, as its disjointed and ethereal sound sets the scene more than perfectly for the battle it takes place during, and many others bring together either lighthearted feelings (‘The Little Sprite’ comes to mind) or of hope or melancholy (again of note, ‘Fear of the Heavens’ and ‘Fond Memory’). Hiroki concocts an amazing score to set the game to, and every track is unique and incredible in it’s own fashion. By now, you probably get that this is a great game. Not only is it great, but it’s unique and certainly worth a play through for anyone who’s ever enjoyed an action RPG. This game certainly holds up to the test of time, even outshining some games of the same genre that have come out in the past year. Luckily, the game was re-released on the Wii’s Virtual Console, so now, everyone can step into the past for a few bucks and see what all the fuss is about. The game is not without its frustrations, certainly, but they are worth overcoming to see just what Secret of Mana has to offer.